Each Celestron AstroMaster model is capable of giving optically corrected views of land and sky. 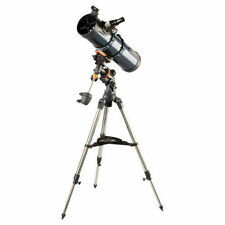 The Celestron AstroMaster series produce bright, clear images of the moon and planets. Specifications - Optical Design: Reflector, Aperture: 130 mm (5.12 in), Focal Length: 650 mm (25.59 in), Focal Ratio: 5, Eyepiece 1: 20 mm (0.79 in) Magnification 1: 32.5 x, Eyepiece 2: 10 mm (0.39 in) Magnification 2: 65 x, Mount: CG-3 Equatorial, Optical Coatings: Aluminium, Weight: 24 lb (10.89 kg). Each AstroMaster model is capable of giving correct views of land and sky. The AstroMaster Series produce bright, clear images of the Moon and planets. Newtonian Reflector. CG-3 Equatorial. Light Gathering Power (Compared to human eye). Mount-33"-Sky watcher. Item Condition. Models#21045. Item S pecifics. Stand-31"X5"(rtop mounting windth). Condition is Used but in good condition and in original box. Achromatic super Barlow lens. Very easy to set up and take down, (even in the dark !). Very easy to use. Highest Useful Magnification 307x. Star Diagonal None. Finderscope Built-on StarPointer. Magnification of Eyepiece 2 65x. Focal Length of Eyepiece 2 10mm (.4") standard. Model: 21062. Studio: Celestron. VeRO & IP Rights. We promise to do everything possible to put things right for you. Orders will be fulfilled by our own warehouse or a 3rd party supplier at our discretion. Studio: Celestron. Model: 21048. VeRO & IP Rights. We promise to do everything possible to put things right for you. Orders will be fulfilled by our own warehouse or a 3rd party supplier at our discretion. Omni XLT series features the stable platform of the CG-4 mount and high quality optics. We also added our famous StarBright XLT coating system to further enhance light transmission. MOUNT: Omni CG-4 Equatorial. Each AstroMaster model is capable of giving correct views of land and sky. - Permanently mounted StarPointer. - Quick and easy no-tool setup. Celestron 31045 AstroMaster 130EQ Reflector Telescope Condition is brand new. Received two and both are unwanted. Celestron’s Omni family has always been synonymous with bright, clear views. All optical surfaces on the Omni XLT AZ 102 are fully coated with XLT optical coatings. For years, Celestron’s Omni equatorial mount has set the industry standard for elegant design. Each AstroMaster model is capable of giving correct views of land and sky. At only 25 lbs., it’s lightweight and compact enough to fit in virtually any storage space, but it’s optically big enough to keep an observer happy for years. Each AstroMaster model is capable of giving correct views of land and sky. Specifications - Optical Design: Reflector Aperture: 130mm Focal Length: 650mm Focal Ratio: 5 Eyepiece 1: 20mm Magnification 1: 32.5x Eyepiece 2: 10 mm Magnification 2: 65x Mount: CG-3 Equatorial Motor Drive: Included Optical Coatings: Multi Coated Weight: 10.89 kg. 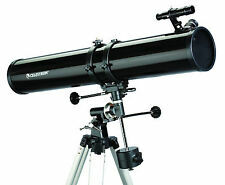 Celestron Powerseeker 127EQ Stargazing Astronomy Telescope. Great beginners telescope only bought a couple of months ago so as new condition. Includes 3x barlow lens 20mm erecting lens 4mm lens tripod and accessories tray and instruction booklet. The bottom of the original box is missing it was like this when I purchased it. Please check out the specs online. Thank you. Dispatched with Royal Mail 2nd Class. Each AstroMaster model is capable of giving correct views of land and sky. Model AstroMaster 130 EQ MD. Specifications - Optical Design: Reflector Aperture: 130mm Focal Length: 650mm Focal Ratio: 5 Eyepiece 1: 20mm Magnification 1: 32.5x Eyepiece 2: 10 mm Magnification 2: 65x Mount: CG-3 Equatorial Motor Drive: Included Optical Coatings: Multi Coated Weight: 10.89 kg. Celestron Astromaster 130 EQ MD Motor Drive Reflector Telescope 31051 READ-INFO. Advanced VX features significantly larger base castings than our previous design, improving stability under heavier loads. This classic design has been upgraded with our StarBright XLT coatings for maximum light transmission. Each AstroMaster model is capable of giving views of both land and sky. The AstroMaster Series produce bright, clear images of the Moon and planets. It’s out of this world! 1 x CG-2 equatorial mount, counterweight bar. Also included is a heavy-duty stainless steel tripod to provide a sturdy and steady platform. Model Omni XLT 150. Mount Omni CG-4 Equatorial. StarBright XLT coated optics to maximize light transmission. Each Celestron AstroMaster 76EQ is capable of giving optically corrected views of land and sky. The AstroMaster series produce bright, clear images of the Moon and planets. - Optical Design: Reflector, Aperture: 76 mm (2.99 in), Focal Length: 700 mm (27.56 in), Focal Ratio: 9.21, Eyepiece 1: 20 mm (0.79 in) Magnification 1: 35 x, Eyepiece 2: 10 mm (0.39 in) Magnification 2: 70 x, Mount: CG-2 Equatorial, Optical Coatings: Aluminium, Weight: 16 lb (7.26 kg). Each model is capable of giving correct views of land and sky. The Astromaster Series produce bright, clear images of the Moon and planets. Mount: CG-2 Equatorial. Optical Design: Newtonian Reflector. Celestron 20mm Erecting Eyepiece. Celestron T-adaptor 1.25in. Celestron 10mm SMA series 1.25in eyepiece. Erect image optics makes it suitable for terrestrial and astronomical use with a 20mm and a 4mm eyepiece for viewing at distance. Fully coated glass optical components with high transmission coatings for enhanced image brightness and clarity. Each AstroMaster model is capable of giving optically corrected views of land and sky. Astronomy Binoculars. Helpful Links. We endeavour to dispatch all orders within 24 hours excluding weekends. MPN : 21064-CGL. Each AstroMaster model is capable of giving correct views of land and sky. The AstroMaster Series produce bright, clear images of the Moon and planets. We will always help you to have a 100% positive happy buying experience. Brand New telescope. Unwanted gift. Sealed and unopened. Due to the size collection only from Ealing, and prefer cash on collection. Please Google for a precise description. Any questions please ask. The AstroMaster 114EQ is a modified Newtonian design. Both eyepieces provide images that are pleasingly sharp. The 10mm eyepiece (100x magnification) does a nice job zooming in on lunar craters or on the planets. Advanced VX features significantly larger base castings than our previous design, improving stability under heavier loads. You also get our StarBright XLT coatings for even better light transmission. The PowerSeeker is quick and easy to set up. Mount: German Equatorial. Optical Design: Newtonian Reflector. -Erect image optics - Ideal for terrestrial and astronomical use. They are designed and manufactured using all fully coated glass optical components with high transmission coatings for enhanced image brightness and clarity. With the capability to split binary stars and separate star clusters, and resolve galaxies and nebulae. Its fairly fast focal ratio gives it the ability to achieve high magnifications with the addition of optional eyepieces. Model: 93514. Studio: Celestron. Release Date: 22/03/2010. We promise to do everything possible to put things right for you. TEXTBOOKS & EDUCATION. Type: Electronics. Colour: Black. CHILDREN'S & YOUNG ADULTS. An unwanted gift. Also included is a CR-Rom "The Sky" Level 1 and Instruction Manual. Schmidt Cassegrain optical design for optimal performance. Optical Design Schmidt Cassegrain. 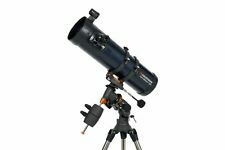 For its compact 11" length, it features a long 1250mm focal length giving it a high magnification potential, and its large aperture ensures the resolution required to see dim deep space objects that smaller apertures are unable to see. PowerSeeker 70EQ. PowerSeeker 80EQ. PowerSeeker 114EQ. PowerSeeker 60EQ. PowerSeeker 127EQ. The Celestron single-axis motor drive runs on a 9V battery, so there are no cords to get in the way. The drive can be used in either the Northern or Southern Hemisphere. The AstroMaster 70 EQ is capable of giving correct views of land and sky and produce bright, clear images of the Moon and planets. Rugged, pre-assembled tripod with 1.25" steel tube legs provides a rigid and stable platform. Celestron AstroMaster 130EQ Stargazing Astronomy Telescope. Dispatched with Royal Mail 2nd Class. The PowerSeeker features a compact and portable design with ample optical performance. Accessories include two eyepieces (20mm and 4mm), a 3x Barlow lens, and accessory tray. Accessory tray for convenient storage of accessories. 14" EdgeHD Optics. Model No. 11094. The CGE Pro 1400 HD combines Celestron's state of the art CGE PRO COMPUTERIZED EQUATORIAL MOUNT with its new EDGEHD OPTICAL SYSTEM. CGE PRO computerized Equatorial mount. Review Celestron. Stainless Steel Tripod. 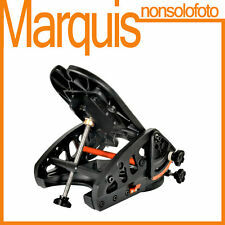 Weight Mount head: 44.0 lb / 20.0 kgTripod: 19.2 lb / 8.7 kg. Mount Type Equatorial. Motor Dual-axis servo with heavy-duty belt-drive system. Celestron 21049 Powerseeker 127EQ Reflector Telescope . Celestron 31035 AstroMaster 76EQ Reflector Telescope .